The news is mixed before the holidays. The federal shutdown put a drag on sales in November. That should come as no surprise. Concern about cutbacks pushed buyers to be more cautious, and sales decreased 13.7% compared to last November. Although this is the biggest drop in the number of sales since the summer of 2011, keep in mind it’s also the first drop since last March. On the other side, sellers continued to enter the market, enticed by rising prices. The number of new listings went up 13.7%–more inventory–and the median sales price jumped to just over 8% since last year. So, what happens when you combine sequestration and seasonal declines from October to November? A standstill, albeit temporary, and one shining fact to keep in mind: Let’s not forget that these same, sidelined buyers may push up demand later. 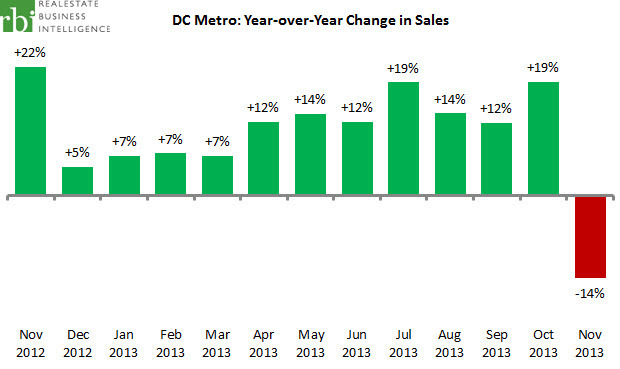 Sales (or units sold) dropped 13.7% compared to November 2012, and about 21% compared to October. (The typical 10-year average change from October to November is -4.4%.) While this is the largest decline in two years, there are bright spots in the news. The number of properties sold year-to-date exceeds total sales for 2012, and condos showed the smallest decline (6.1%). Sales of detached homes, however, dropped 16.2% and townhomes dropped 16.8%. Overall, the region shows a 9.6% price gain compared to this time last year. That’s an increase in the average price from $365,000 to $399,999. 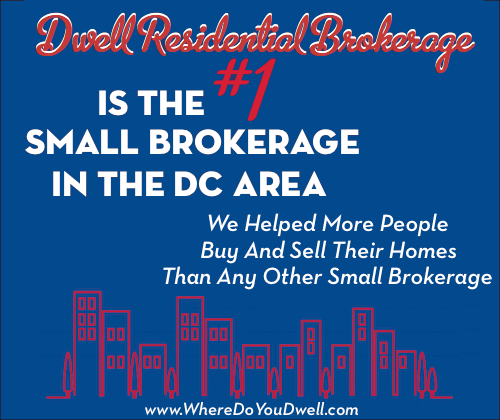 In the DC Metro Area, November’s median sales price hits its 2006 level, with an increase of 8.1%. Standing at $399,950, the median price has now shown annual gains for 22 months in a row! Condos show the strongest gain, at 8.3%, or $22,500, followed by townhomes (5.6% or $21,000). Detached homes come up third, with a jump of 4.9%. The number of new November contracts is also the highest it’s been in seven years– yet another sign that sluggish sales are a short-term shutdown phenomena. New purchases rose 3.3% over this November 2012. Contracts for townhomes led the way this time, with an increase of 6.9%, followed closely by condos, at 6.7%. Unfortunately, single family detached dropped 0.5%. Active and new listings boost November inventory: Active listings are up for the 2nd consecutive month, with an increase of 5.7%. Of course, that’s nowhere near their peak in 2007; in fact, it’s about 68% lower. Single family detached showed a downturn of 0.8% in active listings, and the lowest November level since 2006. In contrast, townhomes and condos showed their 3rd year-over-year increase in a row: Townhomes rose 16.8%, and condos increased an equally impressive 14.5%. New listings jumped 13.7%, continuing its run of double-digit growth for the eighth month. Townhomes ruled this increase with a commanding 23.6%, followed by condos, with 17.3%, and single-family (0.7%). Equally important, days-on-market stands at 20, still an historical low, and not surprising given continued tight inventory.